The website has the announcement of the recruits and staff comments about the new "eight" and a few of the players received "elite level speed" comments from the staff. Speed kills. The quotes also point to expected production right away, I think Hurley and Underwood are going to be great additions and play right away and log a lot of minutes but a few injuries and we are extremely thin on defense. I still expect another addition or two but they need to be guys that can contribute and at least fight for minutes. I know Drew put this in 2019 recruits but my impression is he will be trying to join the team for this upcoming season. He is from Montreal and the NCAA is a lot more understanding if you move to a college closer to your home so you can be near whatever personal issues/family issues are going on. I don't know if that's the case but I have heard he's most likely going to be immediately eligible otherwise that's an interesting move to waste one year of your final two in order to play one, he'd be better off trying to graduate from Sacred Heart this next year and use the grad transfer rule. It looks like he has 3 years in which to play 2 more years. Could sit a year and still play 2. Tsekos was leading points per game scorer for sacred Heart as a sophomore and had only 2 penalty minutes in 31 games. Clarkson has announced its captains. Three juniors, one senior. 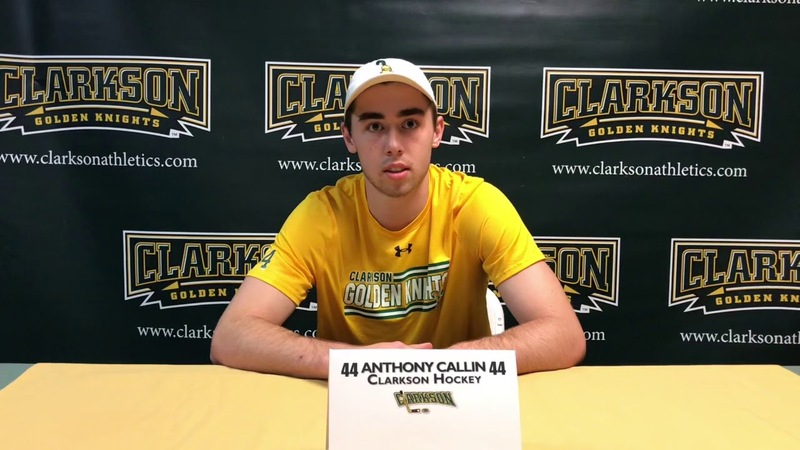 The Clarkson University Men's Hockey team has announced its team leaders for the 2018-19 campaign with juniors Devin Brosseau and Nico Sturm serving as co-captains and senior Marly Quince and junior Jake Kielly acting as assistant captains. Let's see if those juniors become seniors. When does practice start ? A few teams have posted on social media that they have started practicing, I don't know if that time is still limited or not. Cap posted this the other day and they mention the differences they're experiencing, might be a tad ambitious but I'll always love to hear what Underwood says during his segment. Here's the roster, you have to click on 2018-19 where last year's roster is on the men's hockey web site. Maybe a work in progress since Phil Roy is still there.